Oaklanders keep it real. 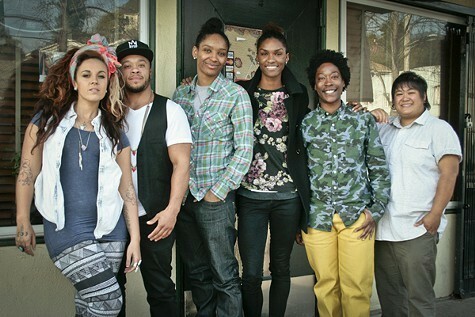 And last night, almost 2 million viewers watched as five queer people of color from the Town schooled the cast of MTV’s Real World: Ex-Plosion on a topic that’s been steadily garnering more media attention: transgender identity. The subject came up around 25-year-old cast member Ari Fitz (who goes by Arielle Scott on the show), a black lesbian, androgynous model, and horror filmmaker who was born in Vallejo and most recently lived in Oakland. Halfway into taping the show — which was filmed in San Francisco last summer and is currently airing on Wednesday nights — rumors about Fitz being a transgender woman surfaced on the Internet and among cast members. Her initial reaction to the rumor — which was false — was negative. “I don’t want to be trans,” she says during last night’s episode, expressing that she felt the misidentification threatened her lesbian identity. Fitz (third from right) and her Oakland friends. We get emails to help Kickstarter campaigns on pretty much a daily basis. As noble and worthy as the endeavors may be, their messages can get lost amid the sea of projects, all needing money and attention RIGHT NOW. But this one caught our eye. Alive Inside is a documentary (with a Kickstarter campaign, naturally) about a social worker who discovers how music can "awaken deeply locked memories in patients with Alzheimer's and dementia." NY-based filmmaker Michael Rossato-Bennett is trying to raise another $15,000 in the next five days to get his movie finished. Check out this rough cut; pretty compelling stuff. And thankfully, it's sort of like the old one. Former Morning Show host Brian Edwards-Tiekert, who was reinstated at KPFA last year after a protracted battle with station management, will host the new "Up Front" news show alongside Sonali Kolhatkar, producer of another morning show, Uprising, at sister station KPFK in Los Angeles. Up Front was formally approved on Monday and launches tomorrow at 7 a.m., and, much like Edwards-Tiekert's previous news program with Aimee Allison, it will feature local and state news coverage, interviews, and investigative reporting. According the Edwards-Tiekert and interim general manager Andrew Phillips, it's designed to pick up some of the slack for metro newspapers, some of which have been forced to slash their editorial budgets. It's being touted as the broadcast equivalent of a "news magazine." Perhaps the most conspicuous change at beloved local R&B station KBLX is the absence of morning show host Kevin Brown — aka "Your Cousin Kev" — who also served as the station's program director. That, and station announcements touting "the new KBLX" clued most listeners into another tectonic shift in terrestrial radio. For months, rumors about a possible change in ownership had burbled throughout the blogosphere, and a few weeks ago they were confirmed. 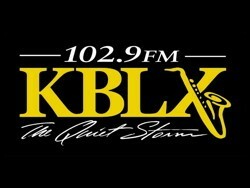 KBLX, one of the only black-owned commercial radio stations left in the nation, had indeed been sold to Entercom, a Pennsylvania-based broadcast conglomerate that operates more than a hundred stations in markets throughout the US, vying with three other kingpins (Clear Channel, Cumulus, and Citadel) for control of an increasingly narrow constricted FM radio domain. Yes, *that* Chris Rock, W. Kamau Bell announced in a mass email sent out this morning, bearing the modest subject line "A Little Bit of Big News." Bell, who has gained local renown both for his ever-evolving solo performance, The W. Kamau Bell Curve, and for his role in the three-person political comedy group, Laughter Against the Machine, has long used race, pop culture, and topical social commentary as his stock-in-trade. He'll traffic in similarly racy themes on his new TV show. What Hidden Economies? 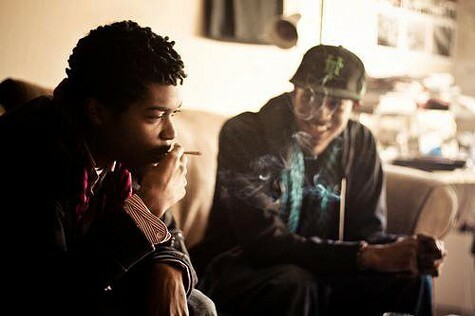 A Refutation of Channing Kennedy's Oakland "Rap Bohemia"
In a new Good magazine piece about the DIY Oakland hip-hop crew Sick Sad World, local writer Channing Kennedy claims to have uncovered the "1 percent of the no-budget rap game." The implication, of course, is that the "rap bohemia" he's profiled isn't just the product of artistic ingenuity and youthful enterprise, but that it also relies on a certain degree of hidden privilege. Kennedy articulates that thesis in value-loaded terms - "One Percent" being the most salient of them. He deploys is as shorthand for "elite strata" when it's actually a term for taxpayers with $380,000 adjusted gross income. He also characterizes the members of Sick Sad World as part of a leisure class, arguing that they have the luxury of time, tech know-how, art-school connections, and full Rolodexes to support their full-time arts careers. Moreover, Kennedy argues, most of the "skilled jobs" are held by white dudes. Essentially, he's attempting to portray Sick Sad World as a marriage of white technorati with young African-American prodigies from the 'hood. That's a reductive, idea, and it's not borne out by his evidence. The Internet all but imploded this morning after Public Radio International show This American Life issued a retraction for what had been one of its most popular shows ever, "Mr. Daisey Goes to the Apple Factory." 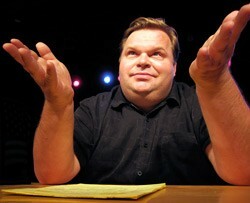 It turned out that playwright Mike Daisey at least partially fabricated the story of his trip to Shenzhen to investigate execrable labor conditions at Apple's Foxconn factory, where many of of the companies products are manufactured. Reporter Rob Schmitz of American Public Media's Marketplace has combed through the story and raised many doubts about Daisey's anecdotes. This American Life will devote its entire program this weekend to Schmitz' findings — the broadcast is currently embargoed on the station's website. However, you can read Schmitz' account here. Even with the resurgent interest in vinyl, it's safe to say that the format will never have the same mass appeal it once had. Which is a shame, especially for 88-year-old Murray Gershenz, who has struggled to find a buyer for the half-million records he's amassed over the decades — supposedly the world's largest collection of vinyl. The records, which currently reside in Gershenz's LA record store/warehouse, and the vinyl enthusiast's son, who struggles to hold on to his father's legacy, are the subjects of a new documentary by Oakland resident Richard Parks, a graduate of UC Berkeley's journalism school and a sometime Express contributor. Music Man Murray, will screen twice this week (March 14 at the Pleasant Hill's CineArts Theater, and March 18 at the Orinda Theatre) as part of the 17th annual East Bay International Jewish Film Festival. If you can't make it to one of those screenings, Parks reports that on Record Store Day, April 21, the 22-minute film will premiere on the Documentary Channel, and will stream for a week at NPR's All Songs Considered site. Music Man Murray (trailer) from Richard Parks on Vimeo.